On dieting with the benefits of soy. Soy protein health benefits with lecithin, saponins and much more to get you on the course for healthy weight loss fast. The benefits of soy would not be complete without the three powers of soy that every dieter should know about: soy protein, soy lecithin, and soy saponins to get the best out of your diet losing weight safely without having to give up your healthy metabolism. What are the benefits of soy in your diet? Weight-loss method that uses soy milk diet, diet okara cookies (cookies made from soy pulp) soy products such as the tofu diet and natto diet gaining popularity in any diet routine. Why is the going-on-a-diet method using a processed soy product gaining popularity like this? In fact, power effective for a diet that helps you lose weight healthy hides in the soybean. In this walk in Slism, we will introduce the benefits of soy protein, lecithin, and saponins in your diet to help you lose weight eating a nutritionally balance diet staying healthy. It contains a lot of nutrients in soy; it brought me to Dieter especially happy effect is the 3 nutrient of soybean: saponin, soy protein and soy lecithin. Let's make sure these three nutrients, whether there is any effect of diet. It's easy to fall behind on protein intake and other nutrients why dieting. Protein is the material which is included in the meat and fish, primarily to make the muscle. Although there are many people who cut down meat and a fish during a diet, it will care only about ingestion calories, and if protein is not fully taken in, you will lose muscle mass making it relatively easier to put on fat and harder to lose weight. Decrease in muscle mass slows down your metabolism leading a lower basal metabolic rate. Basal metabolism is the energy you consumed regardless of whether you exercise or not. When the basal metabolism is higher it becomes easier to become thin, and if basal metabolism is low, it can be said that it is a constitution in which are hard to become thin and it is easy to grow fat. Soy bean is a rich source of high quality protein that you don't want to miss out on when dieting. It is said that as much as 33% of a soybean is soy protein. 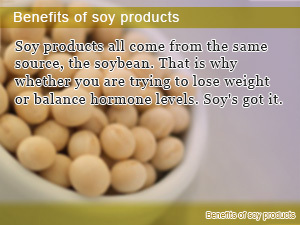 In addition, because it is a low calorie health food, soy can be taken with confidence even while dieting. In soybean, there is power to make a constitution that easy to lose weight and hard to get fat. 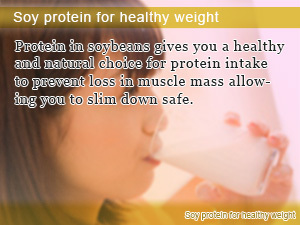 Soy Protein Also Helps To Reduce The Absorption Of Fat! Soy protein, there is a function that combined with the extra fat in the food ingested, as it is discharged. Since fat is being discharged directly without being absorbed in the small intestine, it can be prevented from being accumulated as body fat. By ingestion of soy protein, and the effect of reducing the effect of reducing body fat, LDL cholesterol, and triglycerides in the blood can be expected. Soy lecithin may work with the nature of the water-soluble and fat-soluble, incorporating the necessary nutrients to drain excess fat; helps reduce cholesterol and neutral fat you can expect. Because some functions to remove excess fats in the blood vessels that are stuck, you can expect the effect of a smooth flow of blood. In addition, the lecithin also serves to discharge the accumulated fats in the liver; it is also effective in the prevention of fatty liver. Can also reduce body fat, simply remove the fat in the liver is difficult, however, lecithin are able to also reduce fat in the liver. There is also s power which removes the fat in the liver which cannot remove fat in blood and it not only can reduce excessive body fat, but cannot be removed easily in soy lecithin. Lecithin Helps Promote Healthy Blood Circulation! The inside of not only the diet effect but the fat in blood or a blood vessel is cleaned, blood circulation is promoted in soy lecithin, and the effect of improving the stiffness of the shoulders, oversensitivity to cold, and a lifestyle-related disease can also be expected from it. Moreover, if blood circulation is promoted and a nutrient fully comes to spread round a cell, it becomes beautiful out of the body and can also expect the effect of preparing the tune of skin. The villi of the small intestine, there is a function to absorb the nutrients needed by the body. The more the villus of a small intestine becomes large, the more it comes to absorb many nutrients. That is, it will be said that an excessive nutrient will also be absorbed, so that the villus of a small intestine becomes large. Moreover, it is villous the more body fat, and increases surface area. The constitution in which it will be easy to grow fat if body fat increases in number will be built and it will be said that it will fall into a vicious circle. However, a villus is restored to a normal size at saponin, and there is work which makes the vicious circle of the increase in body fat stop. By restoring a villus to a normal size, absorption of excessive fat or non-fibrous carbohydrates can be controlled, and the constitution in which it is easy to grow fat can be improved. Growing gigantic of the villus which is not visible is also the cause by which there is no diet in a skillful stake. How about taking in soybean saponin on a diet? Saponins for an Antioxidant Effect Giving You Antiaging! Have been in the soybean saponins have antioxidant activity, and there is also a function to remove the fat peroxidation. Although fat, such as neutral fat, says what oxidized by active oxygen, it is supposed that it also becomes fat peroxide a cause of a spot, wrinkles, slack, and aging. Therefore, it is supposed that an effect is expectable in antiaging or lustrous skin by removing fat peroxide by soybean saponin. Soybean protein, soy lecithin, and not only soybean saponin effective for a diet but nutrients, such as soy isoflavone, a dietary fiber and iron, zinc, potassium, calcium, vitamin B1, and folic acid, are contained in the soybean. That the diet using a soybean becomes popular could say that not only three powers introduced previously but nutrition is contained with sufficient balance as one of the reasons. How about utilizing for a diet, after understanding firmly the power hidden in the soybean? The natto diet is an essential part of the diet that everyone is talking about, the Japanese diet. Eat fermented soybeans to block fat from being stored and prevent obesity restoring balance to your diet. Kinako powder diet to supplement your diet helping you get all the benefits of soy in every glass you drink before breakfast. The true elixir for antiaging. ←Previous Figurerobics? How Can I Lose 100 Pounds Like Momu-Chan? Soy products all come from the same source, the soybean. That is why whether you are trying to lose weight or balance hormone levels. Soy's got it. Protein in soybeans gives you a healthy and natural choice for protein intake to prevent loss in muscle mass allowing you to slim down safe. With good circulation comes with many benefits such as relief of stiff shoulder you get from working, the chills and even help your heart. Soy lecithin has it.